Answer the call of the wild. The zebra print hide Rug lets you bring a little safari into your home. Zebra rugs can be used in all interiors, no matter the style. The picture is only to be used as a guide. Since no two hides are the same, please expect some differences between this picture and the hide we will be sending. This “stenciled” animal print cowhide comes from Brazil, the country that unquestionably produces the finest quality cowhides in the world. The leather of each one of our cowhides is very supple and soft, unlike so many other cowhides on the market today that can actually be quite stiff. In addition, our manufacturers do not use any of the harsh tanning solutions that can produce the unpleasant smell that many other cowhide products commonly have. Please understand that all cowhides are not created equal. There is a vast difference in softness, quality and color between factories. Our cowhides are at least as nice, and probably nicer than the hides at the very best retail stores selling for up to $600. We buy 100’s of hides each month and import directly from the best tanneries in South America. 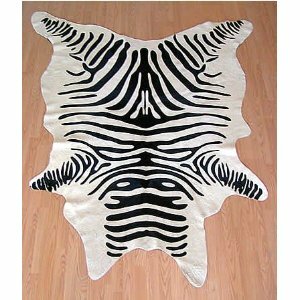 Almost all of the hides used in South America for animal prints, whether they are white for zebras or brown for the other styles, will have the normal amount of shading, speckling and patching that 97% of all cowhides have. In other words cowhides will have the same type of natural markings and imperfections that all animal skins have. Only about 3% of hides are what we call “pure in color” meaning that they do not have nearly as much of this normal shading, speckling or patching. Rarely will you see these “pure in color” hides, even when you are spending $600 and up for a hide at an exclusive furniture store. They simply are too rare. The picture is only to be used as a guide. Since no two hides are the same, please expect some differences between this picture and the hide we will be sending.